Like most people nowadays, you probably end up recording a lot of videos of trips, events, and just life in general with your smartphone, digital camera and other devices. Sometimes you may even go so far as to upload some of these videos to Facebook and other social media platforms to share them with your friends and family – but what if you could do more than just that? Instead of simply uploading ‘raw’ videos that you’ve recorded, you could actually transform your video footage into a home movie with the help of the Movavi Video Editor. Not only will it provide you with the means to improve and enhance the videos that you’ve recorded – but it will also give you the tools you need to polish your videos and make them look great. Cutting the video footage into segments to remove parts that you don’t need and merge clips together to create the final cut of your home movie. Enhancing the quality of the video and correcting common issues such as pixelated, shaky or blurry video segments. Inserting audio tracks to include voiceovers and background music. Placing stylish transitions tastefully between scenes. Adding customizable text as titles, captions, subtitles or watermarks. 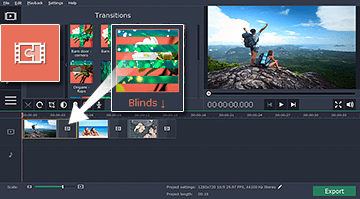 Even though these features are just a glimpse of the potential of the Movavi Video Editor, you should be starting to see how they’ll enable you to turn your raw video footage into a compelling home movie. The fact that the software itself is so intuitive will mean that you don’t need any prior experience to use it and in most cases it will take just a few clicks to get the job done. On your part if you want to really make your home movie look professional then it might be worth taking the time to plan and script it out. Once you have a basic script you will find that using the Movavi Video Editor to cut the footage according to that script is straightforward – and the same applies for any background music, animated transitions or titles and captions that you want to insert. At the end of the day it shouldn’t take you long before you find an approach that you’re comfortable with, and start producing home movies with ease.